The Nanaya algorithm does a lot of heavy lifting to determine your romantic future, generating thousands of numbers that tell us a lot about your next seven years of romance. Unfortunately, unless you’re a computer it’s hard to actually to make sense of them. When Nanaya comes out in a few weeks, you’ll notice several different scores in your personalized four page report. These scores break down those thousands of numbers into something bite-sized and easy-to-understand. Let’s go over what scores exist in Nanaya romance and friendship prediction reports. Want to know how you’re perceived as a lover or a friend? We have you covered with Romance and Friendship Scores. These scores are directly calculated from the algorithm using algebraic formulas and range from 0-10. * However, your personality test results will be scored from -100 to 100. Hot Fling: This score tells you how well suited your personality is for short-term romances. In particular, there are certain traits that make more likely to be successfully at wooing people and having a good time. In short, people who are more outgoing, less serious, and more adventurous will be the type of people who can get someone’s attention and affection – if only for a night.This study by Schmitt and Shackelford does a good job of describing what sort of personalities go into our Hot Fling score. Our personality test is a little bit more detailed than the Big Five assessment, so we we’re able to develop a more nuanced short-term romance score. Finally, this score doesn’t actually come from our algorithm but through reading research by folks like Schmitt and Shackelford. Of course, Nanaya can’t comment on your physical appearance and how it would affect your score – but because the science and technology exists, we certainly could. Slow Burn: This score is the long-term romance version of Hot Fling, describing how well suited you are to keeping a long-term relationship going. Being positive, committed, and thoughtful are important here, but so are some of the aspects of the Hot Fling score. Being creative, open to new experiences, and expressiveness are traits shared by both scores. Because of that, it is possible to score highly in both. A good lover can also be a good partner!Like Hot Fling, this does not come from the algorithm but reviewing the literature on relationship psychology. Romantic Selectivity: This one is tells us how picky you are, as simple as that. 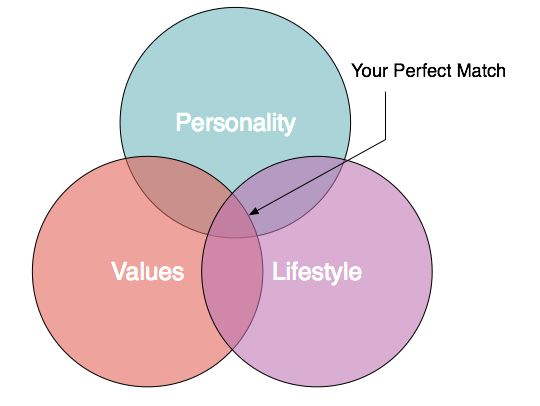 If you were to imagine every trait, value, lifestyle choice, and facet of identity a circle – you’d have a Venn diagram with the intersection being the perfect match. Romantic Selectivity tells you how small that intersection is. The higher the Romantic Selectivity score the pickier you are! This is the one Nanaya score you don’t want to score highly on! That said, even if you have a high selectivity score you might still be in luck if you’re social and interact in the right groups of people. The Venn diagram to your heart. This is calculated from the Nanaya algorithm. *There’s a chance that some early users might see a score above 10. After the first 10,000 users, we’ll readjust the way we score this. Romantic Opportunity While we’ll have a nifty chart telling you your odds of finding love, it has a lot of lines and numbers that might be confusing. We boil that one chart down into one score: Romantic Opportunity. It’s essentially your maximum chance of finding a good match within the seven years. Higher your score, higher your odds. Simple as that!This is computed directly from the Nanaya algorithm. Fun Friend: This is the Hot Fling score for friendship – specifically, how does your personality suit you as a fun person to be around. People who are out-going, light-hearted, and not serious score well – but the traits and values going into Hot Fling are certainly not here. For instance, you don’t need to be open to new experiences to necessarily be a fun friend.This is not calculated from the Nanaya algorithm. Best Friend: By now you might be catching the pattern! This is the Slow Burn score for friendship. But like Fun Friend, some traits and values important to romance are certainly not important to friendship. While shared traits include those related to conscientiousness and patience, independence plays a bigger role here while being deliberate in your actions does not.This is not calculated from the Nanaya algorithm. Social Growth: For Social Growth, we take all the different equations in the Nanaya algorithm for social interaction and add the results in a way that expresses to us what your propensity is for expanding your social circle in the next seven years. This number is the result of hundreds of calculations that we boil down into a single number. The higher your score, the more likely you’ll be to make more friends and, directly, to find love. If you were to say you were interested in moving to a new city in the next seven years, the value will change – not only based on you leaving the city but the size and demographics of the city or cities you’re interested in moving to.This comes directly from the Nanaya algorithm. *Some scores early on may be greater than 10. After the first 10,000 users, we’ll fix that. There’s nothing more esoteric than getting a mystery score on a personality test. I mean what does a Hot Fling score of “5” really mean? Percentiles are a good way to place a meaning to those numbers. A percentile is the percent of people in the population who score below you. If you are in the 80th percentile, that means 80% of the population has scored below you. For every score, we report your percentile compared to people of the same gender and orientation in your area! That gives you a good idea of what that Hot Fling score of “5” means. That 5 might not sound impressive, but if it puts you in the 90th percentile, that might be something to brag about on Facebook. Even though it’s technically impossible to score in the 100th percentile (you can’t score better than 100% of the population because you are in the population), we defined it so you can to stay consistent with other scoring. Rejoice! Nanaya is the first service that finds match scores between you and groups of people – not just specific people. For instance, we rank how compatible each US state is to you – each with a match score. If you log in with Facebook, you’ll have a chance to see how you match romantically and socially with people on your friends list. These are calculated with a special distance formula – much like how folks at OkCupid and eHarmony calculate the same thing. The figure below gives you a rough idea of how it’s done. If there’s some imaginary plane of all possible traits and values, you are assigned a point, think like (x,y) from Algebra I, as a single individual. 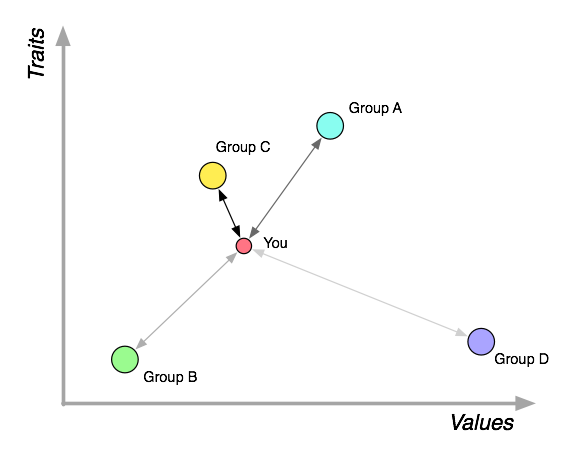 We have come up with a way to assign a single point for groups of many different people – and each group assigned a point accordingly. We simply look to see who’s closest! Below, Group C would score highest because it’s the closest to you in traits and values. Group D scores lowest because it is the furthest. Our calculations are far more complicated that this, but this the general principle. A simplified explanation of match scores. Yes, simplified. *For the first 10,000 users, the maximum scores for every set of matches (i.e. US states, job types, Facebook friends) will be set at 100 artificially. So Group C would be assigned a match score of 100, even though it is possible to get closer to your point. Names for scores are subject to change. Even though we’re close to done, we’ve been putting a lot more work into the algorithm and the site than branding! *Warning: math discussion. If you’ve been scratching your head over all those asterisks, it’s because we’re cursed…cursed by dimensionality. Specifically, the report and match scores and are calculated over enough dimensions that it becomes increasingly difficult to really know how much of these highly dimensional, continuous spaces are sensibly occupiable. Solution #1 is to use the boundary condition on all the inputs – but this is a really big parametric space and it actually isn’t clear what edge conditions are. Moreover that input parameter space is about equal in size to the space of Nanaya algorithm-derived report scores and well above the dimensionality of personality and match scores. Minimally, we can get some idea but it’s a very rough approximation. We’re currently checking boundary conditions in our testing which is why scores ought to converge to less than 10 but we don’t expect that to actually happen. Otherwise, Solution #2 is to let reality dictate the solution – let users fill the space so we can analyze it and see what’s occupied. This will obviously be something we tweak in time, but it will cause scores to vary in time for the first few ten thousands of users. As always, direct all questions, media inquiries, mathematical and metaphysical objections, and invectives to info@nanaya.co. Don’t worry, we’ll always love you.